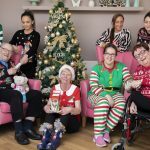 North Wales care home staff and residents jump to it for children’s charity | News by Wales Express News, People Before Profit! 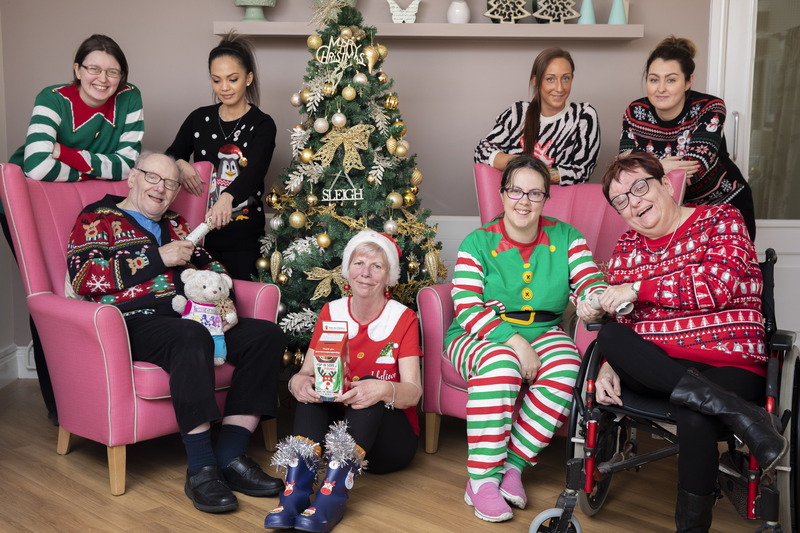 Kind-hearted residents staff at a care organisation jumped to it and donned their festive finery for a children’s charity. Glitter, Rudolph and plenty of Santa’s were on show at Pendine Park’s office and training academy in Wrexham while their care homes across the town and in Caernarfon joined in. Head of shared services Jen Roberts came up with the idea in support of the NSPCC. She said: “This year the NSPCC is our nominated charity and we have held several events throughout the year in support of what is a fantastic charity. 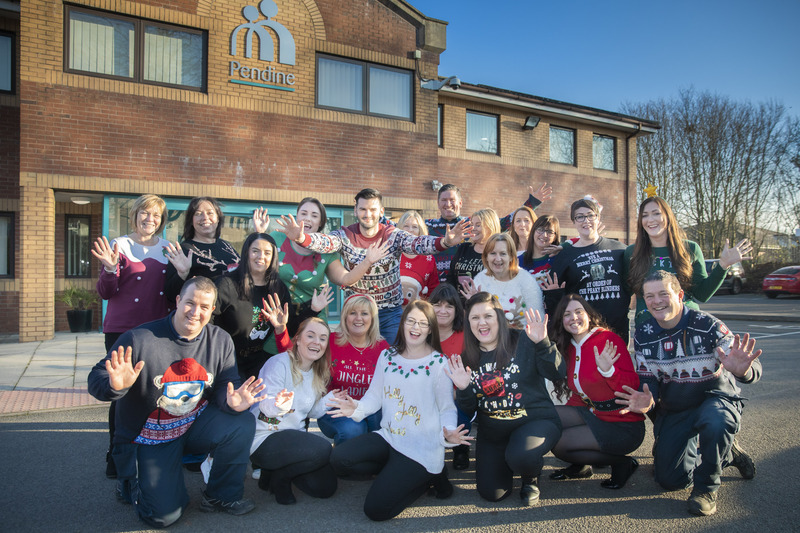 “We held a Christmas jumper day last year and raised several hundred pounds across our care homes and HQ staff. 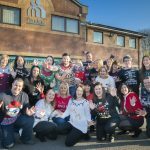 “It’s a lot of fun and in addition to staff paying £2 for the privilege of wearing a Christmas jumper we are also having a few office games with the aim of adding to our fundraising total. Moya Tucker who works in the accounts department said: “It’s been a lot of fun and it’s amazing how many different Christmas jumpers are out there on the market. Jenna Evans, a diploma assessor at the Pendine Park Academy of Care, added: “It’s been great and feels that Christmas is here! Everyone has gladly paid £2 for the privilege of coming to work wearing festive knitwear and some of the office games we have going on have been great fun too. Activities and enrichment co-ordinator Christine Lewis put on her Santa sweater for the event and says staff and residents had thoroughly enjoyed the event. Pendine Park proprietor Mario Kreft MBE was delighted so many staff members joined in the festive fundraising. He said: “Gill and I along with staff chose the NSPCC as our charity of the year and I’m delighted we have been able to help raise money for them throughout the year. Jumpers-3 Getting festive in aid of NSPCC…pictured are residents and staff from Highfield Care Home (Front L/R) resident Noel Hughes, Chris Lewis, Emma Edwards, Resident Emma Locker, Caitlin Washington, Jenna Williams, Whitney Mayers and Ria Roberts. Jumpers- Getting festive in aid of NSPCC Pictured are Jen Roberts, Jenna Evans and Moya Tucker from Pendine park, Bromfield house . Jumpers-1 Pictured are Pendine Park staff from Bromfield House wearing their Christmas jumpers to raise money for NSPCC.